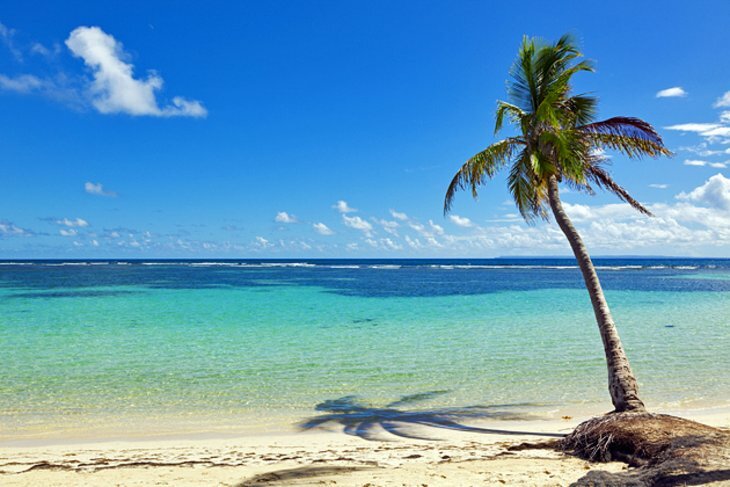 Palm-fringed Sainte Anne is one of the most popular beaches in Guadeloupe. The seaside promenade skirting the shore is a lovely spot for a stroll, and the beach is busy but beautiful, with white sand and shallow water in dreamy shades of blue. This is a great spot for a swim, with typically calm waters. Near the beach is a selection of restaurants and market stalls selling local crafts. To the west, fronting Club Med La Caravelle, Plage Caravelle is another lovely beach with an offshore reef. If you prefer a little more serenity, Plage de Bois Jolan, to the east, is less crowded than Sainte-Anne, but you need to bring your own food and refreshments as the beach lacks amenities. 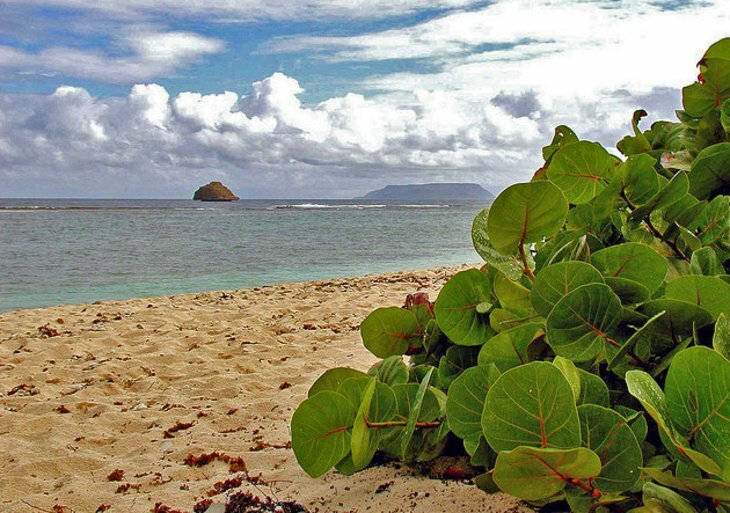 Called the Big Pancake by its inhabitants, Marie-Galante is a round, flat island known for its gorgeous beaches. 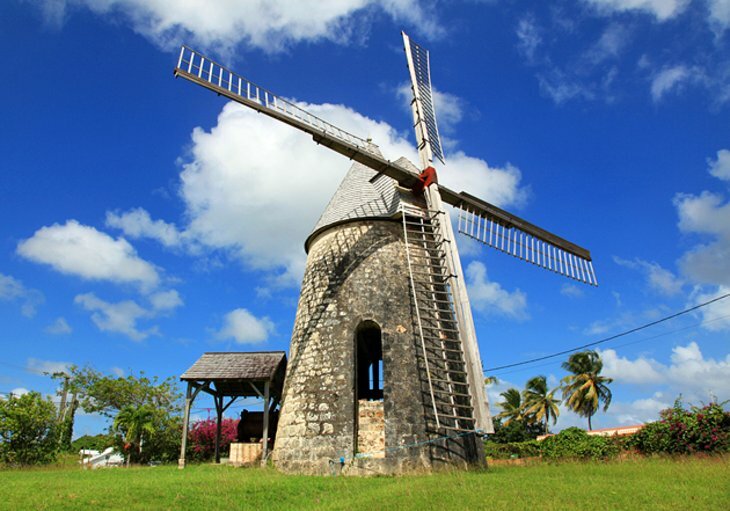 Sugar farming and tourism are the primary industries, and you can see the ruins of many windmills around the island. Sunbathing, swimming, hiking, and local events are all popular activities. Built in 1839, Château Murat was the biggest sugar plantation in Guadeloupe, and its eco-museum honors Marie-Galante’s arts and culture, including the history of its sugar industry. Also on-site are a restored colonial mansion, windmill tower, the ruins of a sugar factory, and a medicinal garden. Feuillere Beach is one of the nicest stretches of sand on the island. Meaning “The Desired One” in French, La Désirade certainly lives up to its name for travelers who want to escape the tourist crowds. This peaceful island lies about a 45-minute rocky boat ride from Saint-Francois on the southeastern coast of Grande-Terre. Composed of tabular rock, it is the oldest island in the Lesser Antilles and was once a leper colony but is now a geological nature reserve. Alluring palm-lined beaches, such as Fifi and Souffleur, ring the island, and coral reefs protect its shores. Snorkeling, swimming, and diving are all popular activities here, and a hiking trail at Le Morne du Souffleur offers spectacular sea views. You’ll also see plenty of iguanas and goats during your visit. 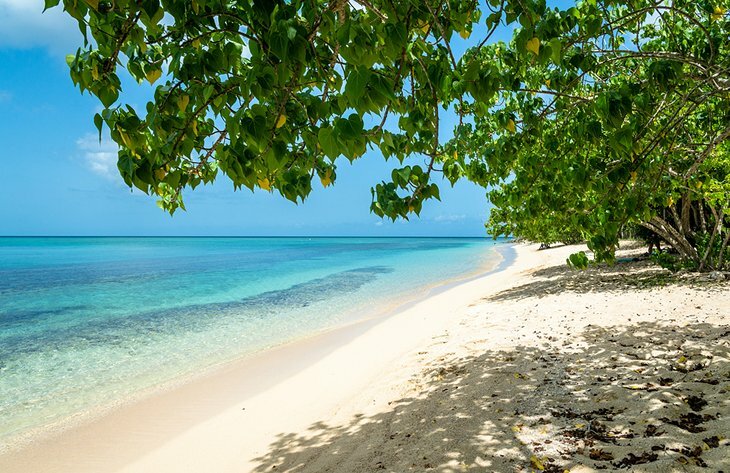 One of Grande-Terre’s prettiest beaches, Plage du Souffleur skirts the coast of Port-Louis, a small fishing village on the island’s northwest coast. Sea grape trees and coconut palms fringe this picturesque stretch of white sand and aqua sea, offering plenty of shady patches to lie out your towel. Depending on the conditions, you might find some decent waves here for body surfing, and when the water is calm, snorkeling can be fun. Food trucks sell Creole food and refreshments. In nearby Port-Louis, brightly painted wooden houses and vintage iron lampposts give the town a cheery feel. A 20-minute drive through an area of desert vegetation leads to Pointe de la Grande Vigie, the northernmost point in Guadeloupe, with sweeping views across the sea to neighboring islands on clear days.